SCOTLAND 2019!!!! MAKE YOUR PLANS!! The 2019 Clan Cunningham International Tri-Annual Meeting will be held in Scotland. and scroll down to "2019 Tri-Annual Meeting"
In 1791 at the age of 15 (*see note below), William slipped aboard a vessel bound for America reaching Chesapeake Bay, Virginia about six months later. In 1794, after serving in the Army, he returned to tailoring, the trade he had learned in Scotland. In 1795 he married Nancy Carr, the daughter of Gideon and Ann Carr of Virginia. While coming from Virginia through the Cumberland Gap, their last child was born. In 1818 after realizing they had little opportunity to expand their family farming operation in Virginia, they moved to Kentucky to settle in the Trigg Furnace section of Trigg County which was still part of Christian County. Here they established a mill and began to cultivate corn and tobacco. William Cunningham took time to serve in public affairs. He was an officer in the first Trigg County election, served on circuit court, and was a road commissioner. He was instrumental in opening the first highway in western Trigg County. William died in 1823 leaving his wife and eleven children. His grave at the Cunningham Cemetery is marked by a twelve foot monument erected by descendants in 1936 honoring his family. It contains the names, birth dates, and spouses of each of the children. William's eleven children, John, Gideon, William, Malinda, Andrew, Dabney, Mickens, James, Alexander, Robert, and Nancy begat eighty-eight children. Since so many of these children had the same given name, a nickname was used to identify the respective family. John's family lived near the river and so were called "The Duck Cunninghams". William's descendants were called "The Buck Cunninghams". Dabney's descendants were called "The Dab Cunninghams". "Tank" identified James's descendants. Since Robert's descendants like to swim and fish in the river, they were nicknamed the "Rats". These nicknames were still being used in the county as late as the 1950's. Somewhere between the dates of 1790 to 1800, William Cunningham, a very forlorn lad sailed in his Uncle's strange ship from Glasgow, Scotland, to the "land of the free", America. Having stolen from home under cover of night with but a change of underwear and a few trinkets tied in a large handkerchief, he boarded his uncle's ship with the intentions of paying a visit to his sister, Mrs. Dr. Samuels of Virginia. William Cunningham, aged 18 years, was considered a good subject for a sailor and his Uncle informed him of his instructions to keep him on board, but on arriving in the harbor of New York, my great grandfather stole 'off board, not relishing the idea of becoming a sailor. It was months before he could work his way to Richmond, Virginia, where Dr. Samuels and his sister lived, where about ten years later he married a Miss Nancy Carr, a very proud and aristocratic young lady. The family name of Cunningham is a place name and is recorded in the early history of Scotland. King Duncan was the first ruler of Scotland. He was murdered by one of his generals by the name of MacBeth, who then took the throne and ruled. Two of Duncan's sons, Malcolm and Donaldbain, fled to escape from MacBeth's soldier. It was at this time that the Cunningham family name was recorded for history. Friskin, son of Friskin, concealed Prince Malcolm by hiding him in a pile of hay, and forking straw over him. Afterwards, Prince Malcolm escaped to England where he gathered an army, returned to Scotland, and defeated MacBeth. Then Malcolm took his rightful place as King of Scotland. Malcolm then rewarded Friskin for saving his life, by giving him the thanedom (meaning "by act of the King") of Cunynghame. Friskin and all his descendants then took the name Cunynghame at this time which makes the name one of the very oldest of family names. King Malcolm gave Friskin approximately 2,000 acres of land in the western part of Scotland bordering on the Firth of Clyde-a-Bay in Ayrshire, Scotland, which included a manor and a church. The Cunningham Castle at Glengarnock, built about 1300, was the home of the Cunninghams for over 300 years. It was a quadrilateral tower with a great court and several less elevated sections, and one of the largest structures at the time. In 1839 a great storm destroyed the North Tower, but portions of the castle are still standing today. 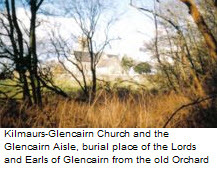 Auchentiber - shows Montgreenan where Alexander Cunnighame was probably murdered - connected with the murder of the Earl of Eglinton. A good place for your clan members to stay - the Mansion House is a hotel. Clan Cunningham - the best starting point! Master Sergeant George P. Crofton - United States Air Force Retired, of Golden Web Page. Tartans, Buttons, Coat of Arms, Link Graphics & Genealogy quotes graphics are our own.